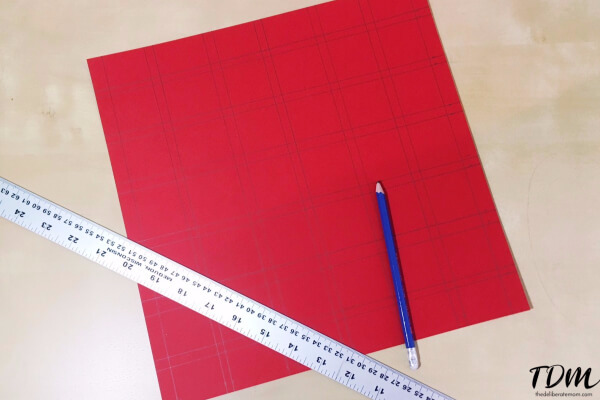 Draw squares on the a sheet of red scrapbooking paper. Make each square approximately 1 ½” wide by 1 ¼” tall with a gap of about ¼” bordering each square. Your lines and measurements don’t have to be perfect (as you can see in the photo below, some squares are slightly larger than others). As long as you plot them in the proper places; as each square needs to be directly in front of a space in the egg carton. I did 5 rows of 5 squares. The top of the calendar I left blank with no squares so that would have space to decorate and embellish the calendar. Place the scrapbooking paper on a cutting mat or a thick piece of cardboard and cut three sides of each square (top, left side, and bottom). Use the lines you drew as your guide for where to cut. Flip over the scrapbooking paper (so that your grid lines are no longer visible). Cut green scrapbooking paper into 1 ¼” squares. 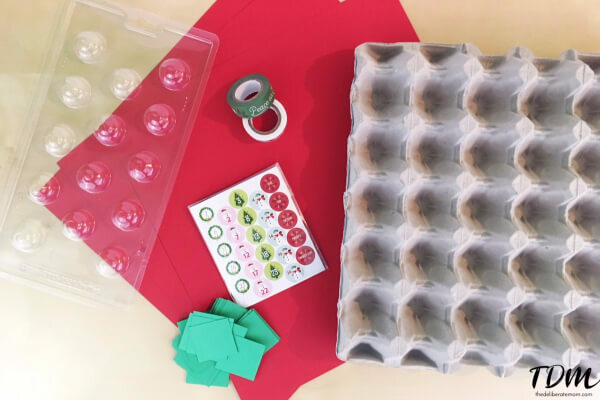 Place a number sticker into the center of each square of green paper (numbers 1-25). 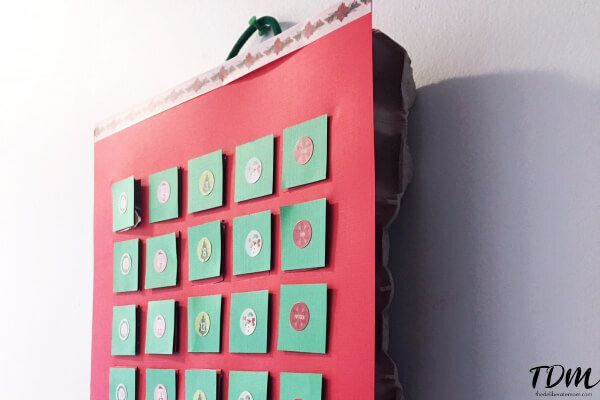 Use double-sided tape to adhere green squares onto each “door” of the calendar. Decorate the top of the calendar with washi tape, glitter, stickers, paint, etc. 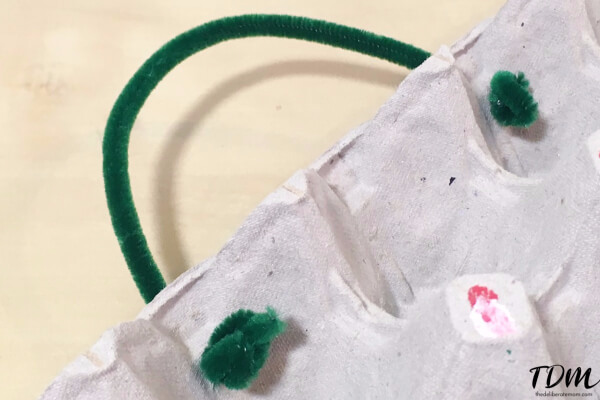 Use the cutting tool to poke 2 small holes into the top edge of the egg carton. Stick a pipe cleaner through one hole and knot underneath. Do the same with the other side. See the photo below for reference. Fill 25 spots of the egg carton with treats. 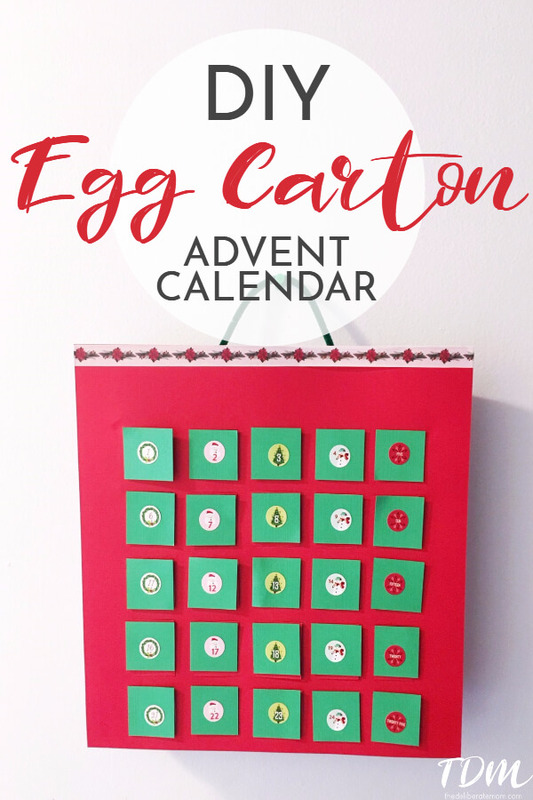 Use double sided tape to mount the “front” of the advent calendar onto the egg carton. I love our egg carton advent calendar. I made homemade dairy-free chocolates for our calendar, but after testing a chocolate by leaving it out for an hour, I realized that it would become a melted mess if I put homemade chocolates in the calendar. So I’ll be purchasing dairy-free chocolate bars to cut up and place into the calendar. I would advise wrapping your chocolates or candies before placing them in the calendar, as it’s hard to know how “sterile” those egg cartons are. This was a lovely, quick project. Older children might even enjoy creating the calendar with you. These calendars would work well with small toys, erasers, bouncy balls, etc. You can get super creative with this calendar! This is such an amazing idea. Now why didn’t I think of this. What a great way to look forward to the holidays. I might just have to make this with Madison, but first I’ll have to find the egg carton. Not sure I have any on hand at the moment, but I’ll have to get it. Thank you for this and here’s to an amazing rest of the week! This makes me happy. The best advent calendar we ever had was one from Milka from Germany. Because the chocolate was divine! I think Scarlet would love this. It would contain some appropriate and awesome treats for my kids!